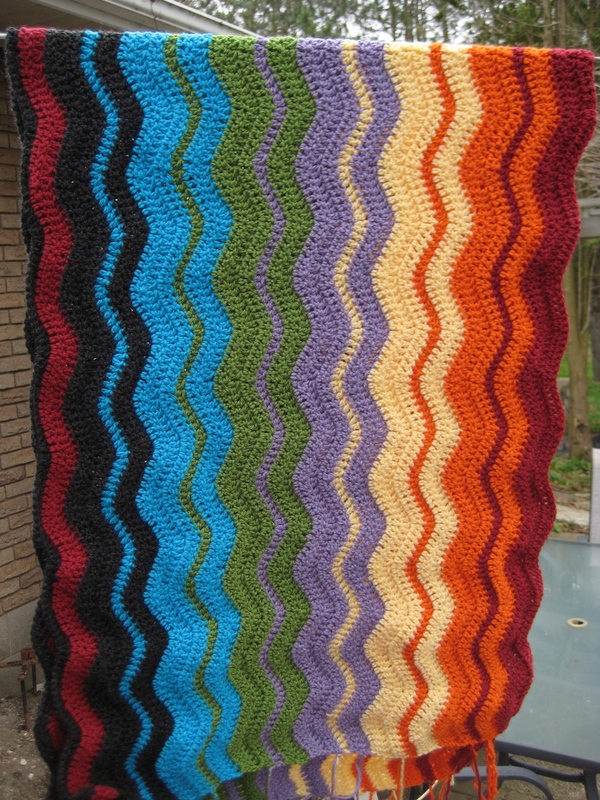 It seems like a long time ago I started the ripple blanket. I was just going to use up some scraps from Miss Murfin’s Christmas afghan and whip up a little lap blanket. A few months ago it looked like this. 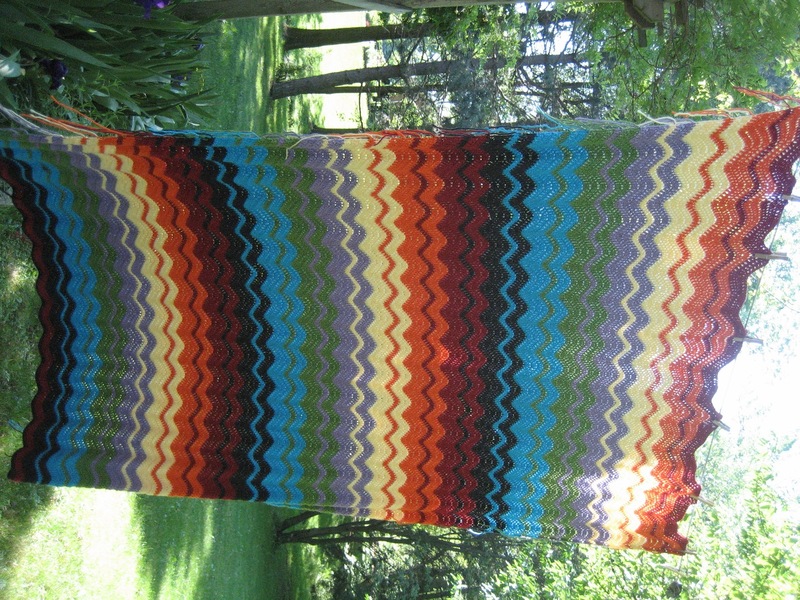 I used 7 colours in what I call the Lucy repeat from the lovely Attic 24 blog. This was one time through the colours. I worked 2 times through the colours and thought, I’d like it a little bigger. 3 times and I have this monster! 6 rows of 7 colours X 3 repeats = 126 rows! Now I have all of these ends to sew in and a couple of times round the edge for a border and I am done! It is lovely and soft and very warm when you have it spread over your lap to work on it. I need to get it finished before the really hot weather get here. Then maybe I can get the African flower afghan done…but I also have a Cath Kidson inspired blanket in the wings. Both done with smaller individual blocks, so good projects for summer. ← The first of the peonies and buzzing trees! There is just nothing on TV that interests me until fall but I sit with my hubby who is STILL watching hockey and work on socks, but I must learn to crochet soon because I just clearned out our sock drawers and they are quite full of my homemade socks! Ripples are fun, but I think the best first crochet blanket is a big granny square! You just keep going until you run out of yarn! Yes I have a hard time watching TV if I don’t have something to do with my hands. The ripple was nice because it takes no concentration. Anything that I have to look at closely either gets put down or goes horribly wrong!